Too bad I couldn't get my real Halloween Kitty to pose for this picture. He's had some issues, but seems to be feeling great right now, thank goodness! I love black cats! This postcard has plenty of black kitties to love! It really isn't for Halloween, but with the addition of a bat and a pumpkin, it looks Halloween enough for me. I love that the mama cat, pumpkin and ghost all look like they're howling. There's a lot of old stuff on this card: paper that I've hoarded, ribbon that I've had forever, and my favorite pumpkin stamps that aren't available any more. If you'd like to create a little black cat love for yourself, you can download the black cat and kittens postcard below. 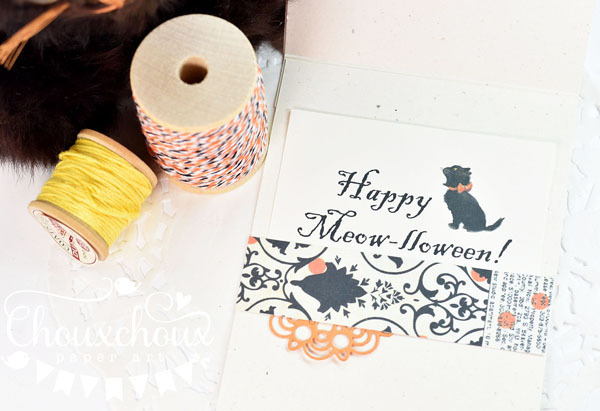 I love this black cat svg cute file - isn't it adorable? 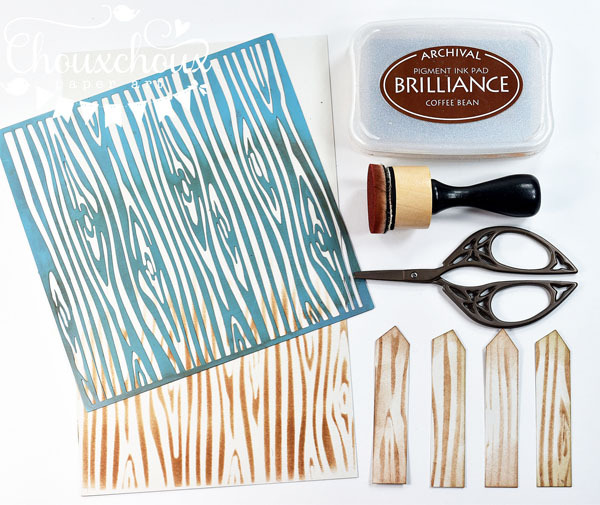 I couldn't get the svg file to link in the supplies list below, so you can click HERE for the link. 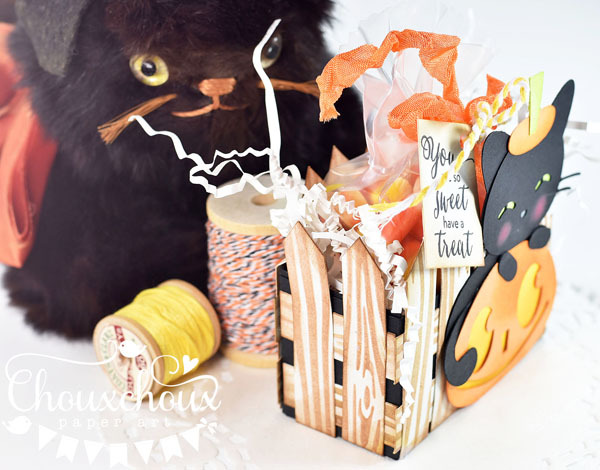 The treat box is made with a siimple black box topped with fence posts. I know it sounds kind of strange, but I think the fence posts are kind of pretty! After stenciling stone cardstock, I cut strips and then hand cut a point on the top. I didn't worry about perfection, I figure this is an old fence and besides it's for Halloween! Here you can see the side, just a couple of rails and fence posts. The sentiment is from my one of my favorite Halloween sets from Waltzingmouse. I think they are no longer in business. I forgot to show you the inside of the card. The sentiment comes with the download. 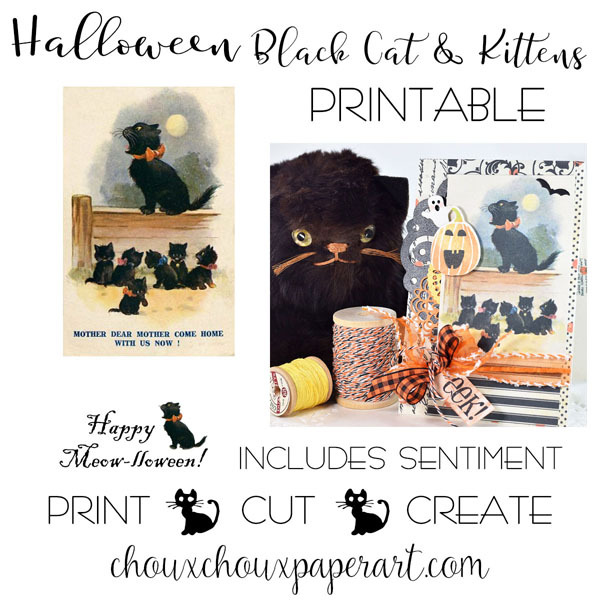 Download Halloween Black Cat and Kittens HERE. Dropbox seems to work differently for different people. Either right click and save when image appears or click the download button in the top right corner. If neither method works, email me and I'll send the files to you. I'll be sending out information on Halloween Choux Box Kits in the next few days. If you would like to see them and you're not a member of the Choux Box Kits Club, go to the link at the top of my blog. No cost to join, no obligations...just fun things to create! We're trying to get Louisa and her mommy and daddy to Savannah. Been holding off due to Hurricane Irma. Our hearts go out to those affected and to those affected by Harvey, as well. Hope you're safe, wherever you are. Wishing you a lovely week! So glad your real Halloween kitty cat is feeling better & hope that continues! 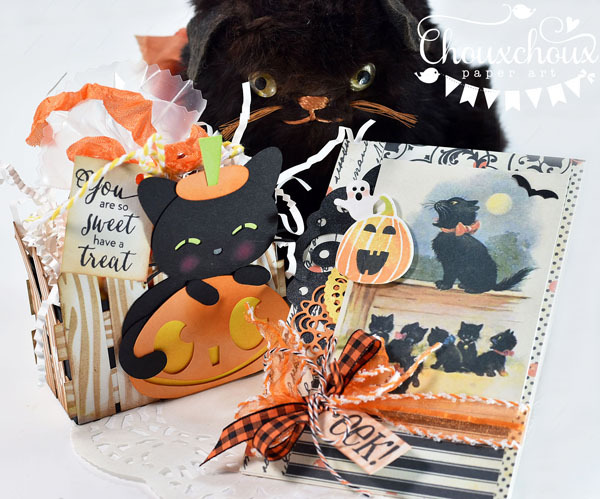 The row of kitties is just so adorable & I love that you used it for Halloween, Lori! Gotta say--the fence is super creative & wonderful! I've considered getting a fence die, but now I see how to make my own! Thank you so much for this supercute and fun black cats, LOVE them so much!!! :D And wish a lot of good health to your furry friend! Your card and box look fabulous!!! Such brilliant idea making the box with faux fence posts, you are so creative and clever! These are adorable!! 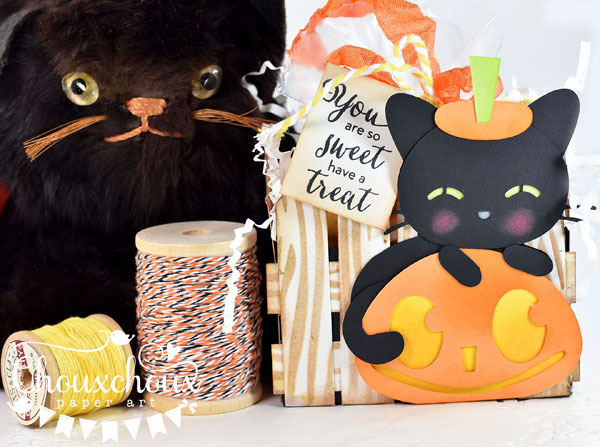 I love all of the black cats and the treat box is sooo cute, awesome fence post! 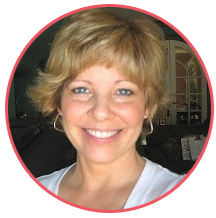 Darling Halloween projects, Lori! Love all the black kittens, so cute! Reminds me of the black cat we had at one time, Blackie. And, so creative how you made the fence! Hope you and family are doing well! oh my goodness!! 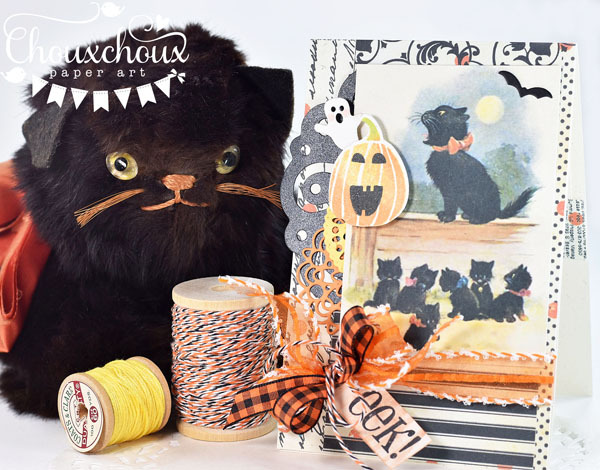 love, love, love your super cute Halloween card and treat box!! Your packaging ideas are always a delight. Totally sweet. hugs! Adorable! Love your handmade fence! Quite awesome! Hi! I'm Lori. Cute and sweet makes me happy. 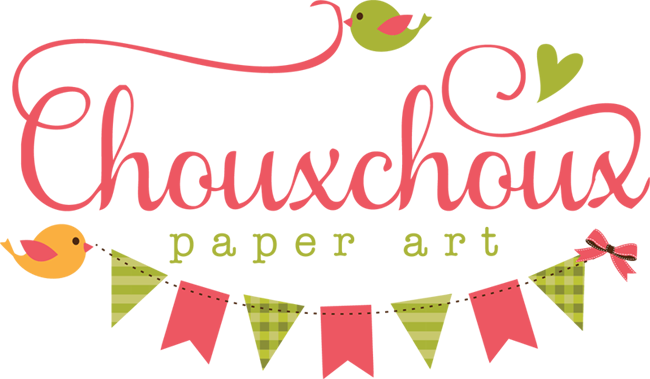 Welcome to ChouxChoux! Get the latest posts delivered to your inbox! How Do You Make A Skeleton Cute?